Home > Google News > Google AdWords > Google Keyword Planner Showing Data Ranges For Advertisers Without Campaigns, A Bug? Google Keyword Planner Showing Data Ranges For Advertisers Without Campaigns, A Bug? This page shows ranges for search volumes. For a more detailed view, set up and run a campaign. Meanwhile, many are very confused by the results the tool is now giving. They think the tool is broken when it might be just a change in policy to only give better data to those who are running campaigns. Although that logic seems a bit wrong because some may want better data before deciding to run a campaign? This change comes a month or so after a bug removing keyword planner access and starting false rumors. 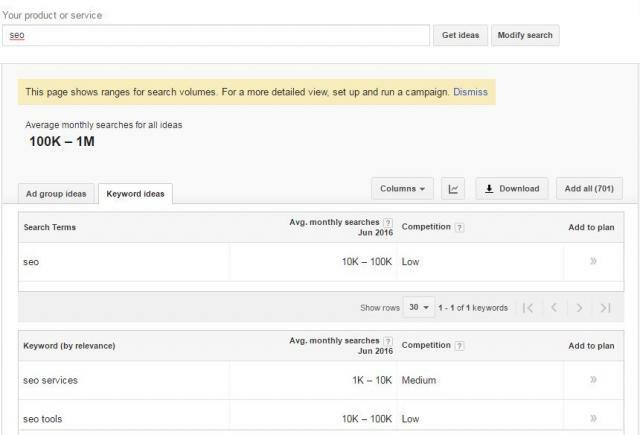 Most advertisers will see search volume data in Keyword Planner as usual. Advertisers with lower monthly spend may see a limited data view in the Keyword Planner. For example, you may see values such as 0, 1-100, 100-1K, 1K-10K, 10K-100K, 100K-1M, 1M+ in the average monthly searches column. In addition, other advertisers may trigger the limited data view by reaching a limit on the number of searches for search volume data (specifically, requests to our API). Access to traffic forecast data will remain unchanged. These changes will ensure that AdWords advertisers are able to get the data they need to optimize their accounts.